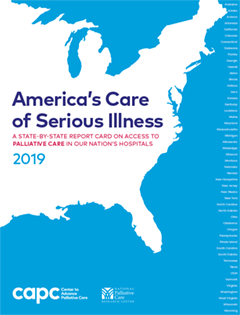 The 2015 State-by-State Report Card demonstrates that access to palliative care remains inadequate for millions of Americans living with serious illness despite continuing growth in the number of U.S. hospitals reporting palliative care programs. Palliative care is specialized medical care for people with serious illnesses. It focuses on providing patients with relief from the symptoms and stress of a serious illness. The goal is to improve quality of life for both the patient and the family. Provided by a specially-trained team of doctors, nurses and other specialists who work together with a patient’s other doctors, palliative care provides an extra layer of support. It is appropriate at any age and at any stage in a serious illness and can be provided along with curative treatment. Building on our previous Report Cards of 2008 and 2011, this report tracks the growth of hospital palliative care programs across the fifty states and identifies areas where persistent gaps in access remain. Drawing data from the American Hospital Association (AHA) Annual Survey Database™ from fiscal years 2012 and 2013, and the National Palliative Care Registry™, we examine the prevalence and geographic variation of palliative care in U.S. hospitals. The goal is to both inform the public and policymakers, and to help increase the availability of palliative care for the millions who need it. To learn more about palliative care and to access the Provider Directory of Hospitals, go to GetPalliativeCare.org. Click here to access the accompanying article in the Journal of Palliative Medicine.